Small pest animals like squirrels, coyotes, and groundhogs don't stand a chance against Federal V-Shok ammunition. 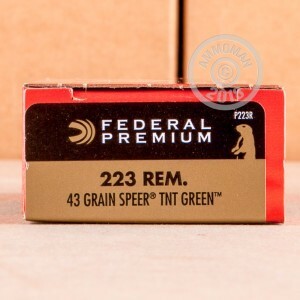 These .223 Remington cartridges for AR-15s and other .223/5.56 NATO rifles fire a light 43 grain Speer TNT hollow point bullet at 3,600 feet per second. This high muzzle velocity combined with the fragmenting design of the TNT produces deadly effect against varmints while minimizing the risk of over-penetration. 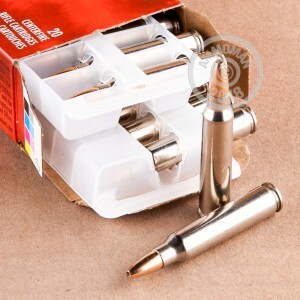 This ammunition is lead-free and uses non-corrosive Boxer primers and brass cases. It is loaded in Anoka, Minnesota; the bullets are made by Speer in Lewiston, Idaho. A great American-made choice for hunting small game and pests. 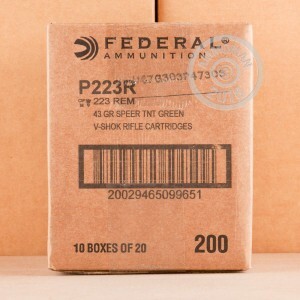 Buy a few of these 20 round boxes or any items over $99 to get free shipping from AmmoMan.com!